The dining room got a little refresh in the past two weeks and she was ready and excited for her debut. I moved and rehung the pieces on the walls, ordered new side chairs and picked out a new rug. It was time to switch things up a little and I love the outcome. 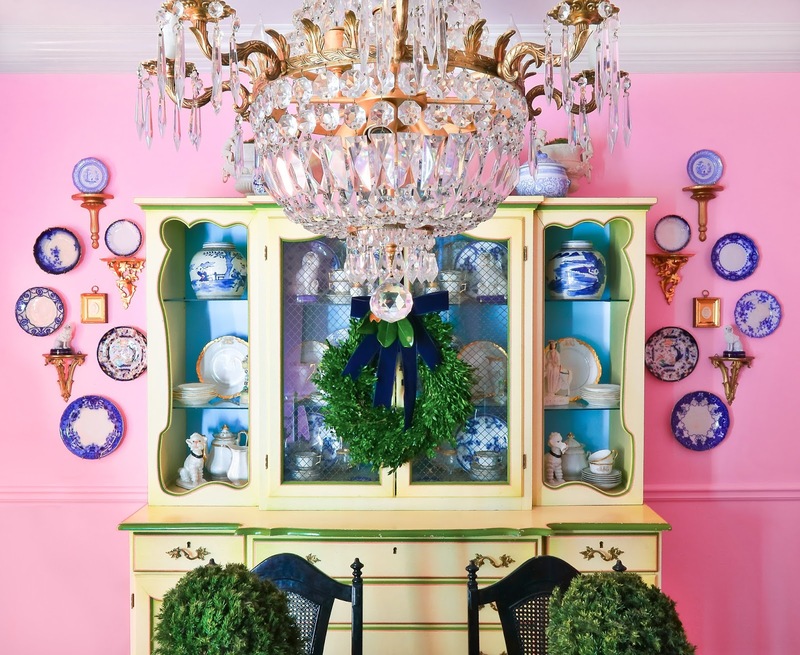 After painting the back wall of the china cabinet blue a month ago I knew I would love all the changes. Next up, wallpaper for the ceiling. With the exception of the table "linens" the rest of the table pieces are what I already owned. I scored the scallop Spode plates at Scott Antique Market this month for a mere $30 for eight of them. Aren't they fabulous? 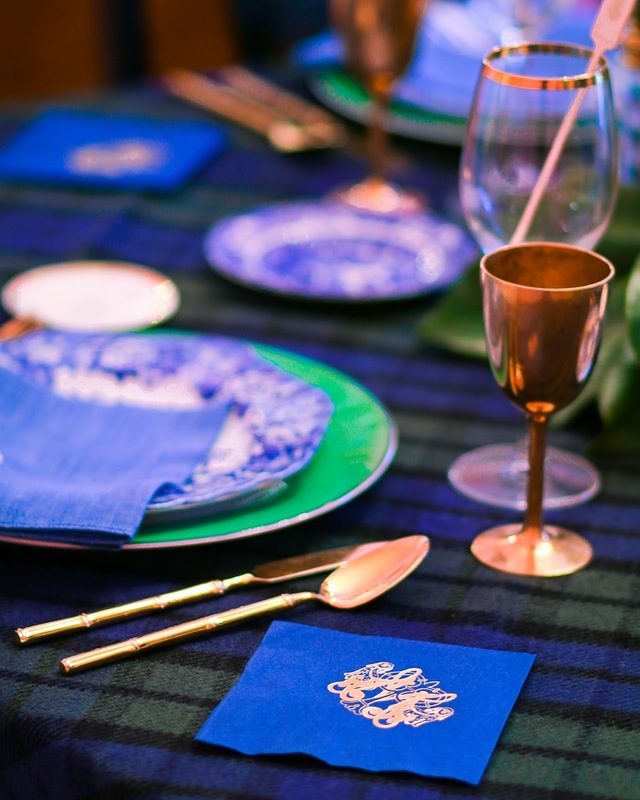 I am in love with the monogram napkins and think the blue and white will basically match every single thing we own. Thank you to The Monogram Merchant for the amazing napkins, they are gorgeous. I added place cards and menus from last years table and they are just as perfect this year as last. Since the menu for Thanksgiving doesn't change around here I see us using them year after year. Aren't they beautiful? You can shop these and even more stunning menus and invites at Dixie Design Collective. This design can be found here and was created by Gina Langford. 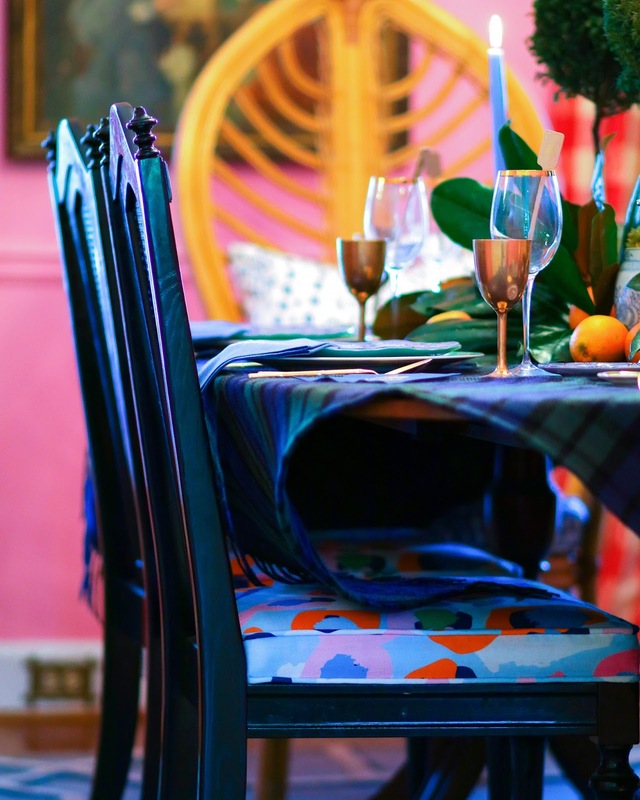 I really love our table this year ... so full of color, the perfect addition of plaid and the mix of all the colors and things I really love. To me those blankets made the table. Sometimes you have to think outside the box for the win! For a Heavenly Father who greets me every single morning with a perfect combination of unending love and unfailing grace. I am not worthy but I am ever grateful. For a husband who married me for me and hopes that never changes. It is his silly jokes that keep me laughing through the tears some days and his ever consistent nature that keeps me steady. For three perfect (in my eyes), kind, loving, funny and precious gifts. I truly didn't think I could have custom ordered children more perfect for us. I am so thankful every single day God chose us to parent these amazing human beings. For our home that provides a safe haven for us daily. For best friends that are there no. matter. what. I don't think I would have made it the last six months without Holly and Lance gluing me back together and telling me I could do it and it would be fabulous. For an industry that embraces me for me and celebrates it. For adventures and travel that fill my heart with so much happiness. For friends and business acquaintances that have truly changed my life. And for you, who read, email and brighten my every single day. Thank you. And how can I forget ... thank you Kristen for these amazing photos and the fun video posted on Instagram last night. You are a gift! Happy Thanksgiving from The Minears. For all the best shopping for Black Friday check out this post which I have been updating. As I spot the sales I will add them to the list ... happy shopping!